In one of our posts, we shared 21 basic wilderness survival skills that we believe all beginners should take the effort to learn them for their safety. While they are a lot of actionable tips in that post, we are assuming that you are completely defenseless (without anything with you). In most cases, you wouldn’t be in such an epic situation, unless you choose to be in. We often encourage campers, survivalists, hikers and anyone that are entering the woods to keep yourself prepared with all the things you need. And in order to help you to achieve this goal, we created a complete checklists of all survival gears you will need during your trip in the wilderness to our best knowledge. Rather than slapping a list of things in this post, we actually wrote some descriptions along with each important thing to bring along. You should probably know that without water, you can only live up to three days, at most. Therefore, it’s wise to bring along sufficient amount of water that can keep you hydrated throughout the whole trip. While it’s possible to collect clean water in the wilderness, the whole process can be complicated and overwhelming for beginner adventurers. Besides locating the source of water, you have to master the skill of boiling water. Before you are really good at collecting clean water, bringing along sufficient amount of water can really make a difference. It’s best to bring these emergency meals or rather known as MRE (made, ready-to-eat) along as compared to normal foods such as biscuit before entering the wilderness. Just a short introduction, MRE are food packets created specially for military purposes. They have been developed since World War 1 and are still being used now, with some changes here and there to improve their functionality. So how is it special? First off, these meals consist of foods that will provide you with a lot of energy just by consuming a small portion of it. This way, you don’t have to trouble yourself carrying loads of food as they can be replaced with this emergency meals. Besides, MRE follows a strict packaging requirement. They are made to have a shelf life of three years, though it fluctuates based on storing methods. Also, they are made to withstand extreme temperatures, which is something you are going to experience in the wild. Modern forms of MRE comes in various flavors, so you have to choose what is best for you. Check out the ingredients in case you are allergic to some of them. They also include vegetarian meals. You can also check out our survival food reviews for details on the top selling brands. If there is one survival gear you wouldn’t want to miss, it’s the first aid kit. First of all, you have to realize that it’s extremely easy to get hurt in the wild and, any small injuries, even a small wound, can be deadly if not being adequately treated. Antiseptics and Antibiotics. These are really important items to kill bacteria and prevent infection on an open wound. In most cases, antiseptics alone should be working great. If you want to play safe, consuming antibiotics or applying them (powder form) on the wound will be good. Helps to relieve swollen joint pain and reduce temperature if a fever occurs. These are just a few basic items that should be included in a first aid box. A more detail list of items can be found here. A tent is like your house in the woods. What do you think your life would be if your house is taken away? You will be vulnerable to natural elements – rain, sun, snow. Many times weather in the wilderness are extreme. When it’s hot, it’s burning hot. When it’s cold, it’s freezing cold. Tip: In reality, there are many different kinds of tents with different qualities and functionalities. Remember to pick the type that suits you best because it’s your HOME in the woods. Of course it’s possible to build a shelter from scratch using natural resources around you. However, it wouldn’t even come close to a tent in terms of comfortableness. Also, it’s not an easy job to build your own shelter, it takes lots of work and knowledge. Check out some of our tent reviews here and here. Sleeping bag isn’t really necessary for everyone (provided you bring a tent along with you). For me, it’s always better to bring alone even if you do have a tent. Let me tell you why. A sleeping bag is much more comfortable. Trust me, it’s not easy to sleep in a tent because it’s uncomfortable especially for first timers. Good quality sleeping bags have a thick, comfortable base as if you are sleeping on a bed. Most tents are not totally sealed. There are rooms for ventilation.Therefore, if your tent doesn’t come with a mosquito net, it’s often better to sleep in a sleeping bag. It keeps your whole body covered, invulnerable to mosquito. As you can see, the primary role of a sleeping bag is to help you sleep better by providing more comfort and protection. While some deemed it to be unnecessary (due to the fact that it takes up a great space in your backpack), I personally think it’s wise to bring along, especially for beginners. It’s extremely obvious that you will need a backpack to put all the essential items. However, what I would recommend you to get here is a tactical backpack. Basically, it functions just like a backpack with some exceptions. The best part about a tactical backpack is that it’s made to cushion off the pressure on your back. Meaning to say, you wouldn’t feel the load that you will feel carrying an ordinary backpack as compared to a tactical backpack. Also, it’s rugged and tough that will be able to withstand the extreme conditions in the wilderness. It keeps your stuffs safe in the backpack. When you are choosing a backpack, try out a tactical backpack for once. It may be more costly, but I believe it is worth every penny spent. Clothing includes everything from shirts and trousers to socks and gloves. It’s important to note that proper clothing is essential and there are certain guidelines to comply with. Also, you have to pack the types of clothes that suits the weather of that particular season. Thick, long sleeved shirts. Whether it’s summer or winter, you have to bring along thick shirts that can keep you warm throughout the cold night. Also, it should be long sleeved to provide you as much protection as possible. Thick, long pants. Never wear short pants in the wilderness. It’s always safer to wear long pants to decrease your chances of being attacked by leeches as well as scratches as you roam around the woods. Also, they should be thick enough so that they don’t tear off easily. Hiking boots. Hiking boots give you better gripping to the ground so it’s more comfortable as you walk on uneven grounds. The cushions in hiking boots are great to cushion the impact on your feet. Socks. Get socks that are high up to your knees. They give more protection to your legs. Gloves. Glove are great for two reasons. When you are really cold at night, they act as a heat insulator that keep your hand warm. Secondly, it safeguards your hand from thorns. It’s normal to accidentally hold on trees with thorns. An every-day-carry knife is an essential piece of equipment that you should carry with you at all times. It’s a need for most outdoor survivalists. You might be wondering, why are survival knives important? One simple answer is they are handy and can be useful in various situations. One such situation is to defend yourself from wild creatures. Although survival knives are mostly short-length, they are extremely agile and strong (if you buy quality ones) which makes them extremely powerful for close-combat situations. It’s the agility that makes it powerful for self defense. Besides being great for self-defense, survival knives are great in handling basic stuffs such as cutting ropes, removing leeches and more. You wouldn’t be using an axe to chop ropes right? Truly, it’s useful in many circumstances. You will discover more of it’s uses based on experience, I assure you. One of the main uses of an axe or machete is to chop down trees. Unless you are comparing them to chainsaws, they are actually pretty efficient in gathering wood logs and branches that are used as fuel to build campfires. Also, you find them handy if you are going to build your own shelter using natural resources, assuming you didn’t take a tent along. I know many survivalists that enjoy building their own shelters rather than sleeping in tents. Axe and machete are great weapons that will be able to scare wild animals away. Although they are heavy and lack agility, they are really strong and large. Extra tip, they are extremely useful in dealing with crocodiles. These aren’t really survival gears, but they are really important stuffs that you can’t afford to miss out especially when that particular area you are venturing to is pretty much isolated from food and drinks stalls. Without them, you will have a hard time cooking food and boiling water. It’s important to note that it’s really hard to boil water (so that it’s safe for consumption) without any cooking utensils and the amount of water that you can collect is fairly little. If you are not the kind of person that likes to challenge epic wilderness, just bring along these utensils. They will cut down a lot of your difficult tasks that you would otherwise have to carry out. I guess no one will ever forget this. But since this post is a complete checklist, I think it’s appropriate to mention it. Maps aren’t created equal. There are great and bad ones and they can really make a difference when you are relying on the map for location details. Try to get a map with specific details of that particular area. As a rule of thumb, you should go for those with more details rather than something simple. It’s those details that will really help you out when you are in trouble. In addition, rather than packing a map along just because everyone says it’s important, I normally take an extra step by familiarizing myself with the map before the actual trip. This way, you will more prepared if anything goes wrong. Used it closely with a compass and you should be able to navigate around pretty well. Compass has only one function, to show you the cardinal direction so that you can navigate around based on a map. It’s a must have tool or you will probably lose your way in the forest. Also, it’s important to note that it’s extremely difficult to create a compass naturally. This is because you need to have something thin with metallic properties in order to create a leaf in puddle compass. Although it’s doable, it’s complicated and you might not get the right directions if you do it wrongly. Compass can be really handy when your GPS (if you have one) malfunctions. If you have no prior experience in using a compass, I suggest you spend some time upfront learning. It’s advised to bring extra matchsticks/lighters because you might used up a lot of them without you noticing it. One example will be starting a fire during snowing weather. You will probably fail many times before successfully starting a fire. Even if you are not on a hunting trip, bringing along hunting equipment will allow you to consume better food, provided you know how to use them. It’s easier to hunt for food with a bow/rifle as compared to knives or bare hands. Traps are also great if you are not good at handling hunting gear. You just need to set up the traps properly and you should be able to catch smaller preys like rabbit, pigs, etc. However, it’s easier to use traps to catch fishes than land animals. Don’t forget your hunting boots as they play a very important role in hunting. I came across a really great resource from Deer Hunting Field where they review hunting boots in great detail. You can check out the article here. Bringing along fishing gears are great too. Normally, I recommend beginners to start off with fishing because it requires less skills and it’s not that dangerous. The only thing that you need to be careful off is to make sure that the streams or rivers are free from bears, crocodile, anything dangerous. Headlamps are one great survival gear that helps you to move around in the dark. For activities that requires movement in the dark such as night jungle trekking, hiking, etc, you will find this equipment extremely handy. The main advantage of a headlamp as compared to flashlight is that the lamp is hung around your head. This means that both of your hands are free to assist you in other things. If you are a hiker, you will know that you need your hands to hold structures that helps you move forward. Notice that I mention smartphone and not a cellphone. If you are still using a cellphone, I strongly recommend that you change to a smartphone instead. Traditional cellphones have only one function, to make calls and that’s it, nothing else. Smartphones are different. They have the capabilities of performing greater tasks and which is what makes them important and useful. GPS (Global Positioning System). Smartphones often have built in GPS which shows you your actual position on a visual map. It really helps in terms of navigation and often functions better than what a map can do for you. Provide information instantly. You can store up information that you might need to use in your smartphone. One great example is the documentation of edible plants in your smartphone. When you left with no food and couldn’t identify which plants are safe for consumption, this information is valuable. Some apps also provide you with information on medical assistance. Flashlight. Smartphones come with flashlight function. The light produced is rather bright and can be a good alternative light source (better than matchsticks and lighters). Video Call. Video call is a better form of communication especially in times of need because it communicates information at a greater speed. For example, your teammates could identify your location by looking at the surroundings shown during a video call. While smartphones are extremely useful, they have their drawbacks. One of the main problem is that their battery life is short – extremely short. Typically, even the greatest ones can only last up to 6 hours if you are using it continously. Therefore, a great power bank is vital here. A good power bank should be brought along to ensure the sustainability of your smartphone. Having that said, smartphones are still the best survival gear you should take along with you. Vision is probably one of the crucial aspect that you need to consider in the wilderness. That’s why survivalists/campers make sure they carry along flashlights, cellphones, matches or any other form of light source. However, what they often missed out are binoculars. You will need far vision just as much as short vision. It’s always better to scout ahead to keep you prepared before moving around. For me, binoculars are really great survival gear because they allow me to observe the surroundings without actually having to scout around. Also, I find binoculars important because I get to look at animals clearly from a distant (they are dangerous animals). Check out the best binoculars for both scouting and hunting here. We also included a comprehensive buying guide as well. It’s also best to get a binocular harness along with your binocular. One of the intangible survival gear that you must bring along with you is your knowledge. It’s not just any form of knowledge. You have to know the ins and outs living in the wilderness, from building a campfire to hunting and escaping. There are many ways to acquire this form of knowledge. One of the direct ways is to engage with a wilderness survival trainer. There, you will learn everything you need to keep yourself alive in the woods. If you plan on entering the wilderness alone, or going for an ambitious hunting trip, really consider going for one of these courses to equip yourself with adequate knowledge. While joining survival training courses helps, learning through experience is another way of acquiring the necessary knowledge. However, it’s advisable to go in groups when you are still a beginner. Don’t ever underestimate the danger you might encounter in an ever changing wilderness situation. While you might not be an experienced survivalist, at least equip yourself with the basic wilderness survival skill now. It’s always better to be safe than sorry. Spend a little more time in making sure that you have not left out anything will ensure that you will have a pleasant, exciting and safe adventure. 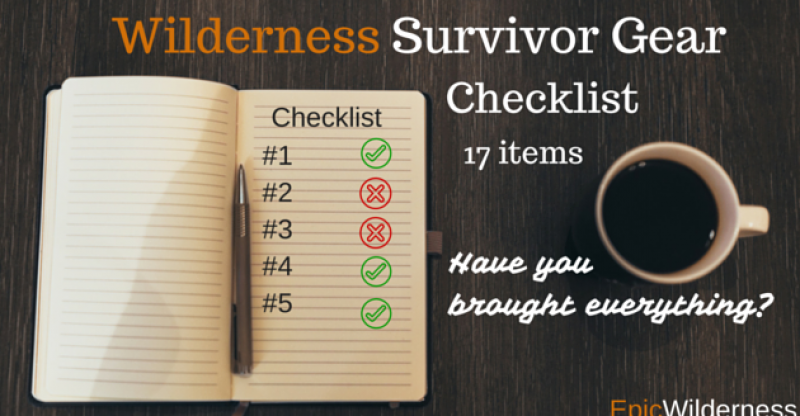 We hope you find this wilderness survival gear checklist helpful. In order to help you gain more value from this post, we created a FREE printable checklist version of this post for your convenience. Just click the download link below. What do you think is necessary for you? Is there anything we missed out in this post? Let us know in the comment area below.